Risico’s bij gebruik van elektrische instrumenten op tanden! WHAT IS NATURAL BALANCE HORSE DENTISTRY? Natural Balance Horse dentistry is the anatomical alignment of the occlusal surface, by the adjustment of excessive enamel folds to provide guidance and stability to the temporo mandibular joint (TMJ). This allows for maximum lateral motion and anterior/posterior motion of the mandible to give the horse optimal neurological, proprioceptive and physical performance. By adjusting any restrictions in the horse’s dentition, the horse gains a complete and natural movement of the jaw (side to side, forward and back). This balances the TMJ and maximizes surface-to-surface contact between teeth, which allows for full neurological and proprioceptive function to the horse’s whole body. Horses have between 36-40 teeth that never stop erupting (growing). Horses’ teeth are calcified nerves and are directly connected to their neurological system. As a result, any imbalances in their dentition can cause huge problems throughout their whole body. For horses to perform at their highest potential they need to have optimum neurological function. By adjusting the excessive enamel on the teeth, we balance and stabilize the TMJ. That, in turn, creates a complete neurological connection to the body, which increases muscle mass, stride length, and flexibility, along with improving posture and over all performance. This is called Natural Balance dentistry, and makes for some very happy horses! Check out this article by Dr. Rhiannon Fenton (DVM, CAC, CVA, CVFT) that appeared in the June/July 2016 edition of Holistic Horse Magazine. Natural Balance dentistry can help all horses in all disciplines, from international competitors to pasture ornaments! Depending on the severity of their imbalances, it may effect different horses in different ways. What you may think is a small imbalance, may be very big to them! Why do you address incisors? Incisors are the point of beginning and the most important part of a horse’s dentition. They support and guide the TMJ, which in turn dictates how a horse will move and stand. It is important that the incisors be balanced for each individual horse. Just making them straight, won’t actually balance the horse. The horse’s individual structure must be taken into consideration, and the teeth balanced accordingly. When the incisors allow for complete lateral motion and anterior/posterior motion, the horse’s whole body will also have a full range of motion! Isn’t it easier to power float? Maybe. But the repercussions are not worth it. Equine power instruments are not as advanced as the ones used in human dentistry. They spin at a much slower RPM, which heats up the tooth and makes it brittle. It is very difficult to make minor adjustments. By changing too much too fast, you can cause long term neurological damage. More sedation is used, which makes the horse stand in an unnatural position. Therefore, their teeth will be balanced in an unnatural position. No. We are not vets so we are not certified to use any IV sedation. Fortunately there are other options! A lot of horses don’t need sedation, making this a non-issue. For those who do, we often use essential oils, cranial sacral releases, as well as calming products that are available to horse owners themselves. There is always the option of working with a vet as well. The Adavanced Whole Horse Dentistry Learning Centre, founded by Spencer Laflure. What can you do for my 20+ year old horse? There are lots of things you can do to help the senior citizens of the horse world! Floating their teeth is not one of them! From the age of 20 and up, a horse’s body and joints have completely morphed, the eruption rate of their teeth has slowed to only 1mm per year and their TMJ is now in a permanent position. Whatever imbalances the horse has, are what is supporting the TMJ, and whatever teeth they have left we want to keep for as long as possible. By changing anything in their dentition, we could cause neurological imbalances, muscle soreness and even dislocation of joints. It is still important to have a dental check up! As horses get older their teeth will slowly expire. As this is happening, some teeth might become loose which makes them sensitive while the horse chews. Sometimes all these teeth need are a little encouragement to fall out and it will give the horse a ton of relief! Once a horse starts losing teeth, it is possible that the remaining teeth will erupt into the gum on the opposing arcade. If there is a tooth causing tissue damage, this is the only time when we will work on an old horse. Osteopathic work and feed changes are also something that can greatly help a senior horse! 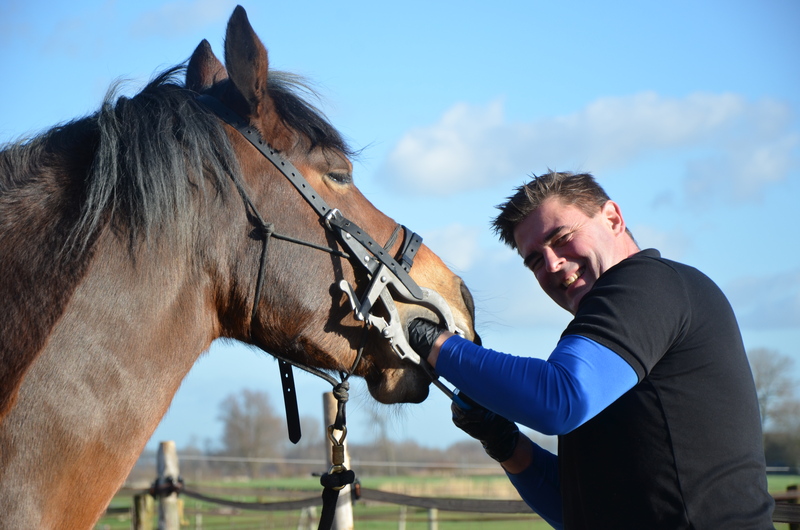 Dentists can give you recommendations on what will benefit your horse the most! Wild horses don’t get dental work? Wild, or feral, horses eat with their head in a lowered position (grazing) for an average of 20 hours a day. During that time their jaw is in a natural position, and they are chewing, which helps naturally wear their teeth. Unlike the hay we feed domesticated horses, the grasses they eat are high in silica. This is a natural abrasive, which also helps in the wearing of teeth, and reducing dental imbalances. Natural selection. Horses that are not structurally sound, or balanced will have dental imbalances. In the wild such horses will not live long, therefore they will not reproduce. Most wild horses are never asked to jump a 5 foot fence, spin on a dime, extend their trot, preform sliding stops, turn barrels at high speeds, move laterally over a poll, or walk on a moving bridge. And they are definitely not asked to do that in a high stress environment while remaining completely collected and listening to every move made by their rider. Will my horse eat better? Of course. But we would like you to focus on the fact that your horse will MOVE better and gain muscle mass! What age is recommended to start dentistry? Horses start shedding teeth at 2 years old. From then until they are 5 years old their dentition is in a constant state of change. It is recommended to start dentistry around 3 years of age, because by that time the sutures in the skull have ossified. Dental check-ups are still a good idea at a younger age to make sure that they shed teeth properly and that there are no retained caps. Starting dentistry with your horse between the ages of 3-6 is a great way to set them up to be balanced over a long period of time. Regular dentistry will also decrease the chance of injury and heath problems, as well as making training easier throughout their life. All cranial nerves go through or beside the TMJ (temporo mandibular joint). The TMJ is in charge of proprioception, which is what tells a horse where they are in space and time, what foot to move when, etc. The teeth are what balance and guide the TMJ. The TMJ is the most proprioceptive joint in the equine body. This is why any imbalances in their dentition will greatly effect their neurological and proprioceptive function. This is an equine acupuncture meridian chart. A meridian is a pathway of energy in the body, and can also be referred to as a circulatory system connecting the whole horse. This is another form of guidance to the equine body that is connected to their teeth.